Mom-ism Monday #3 is really a grandmother-ism. My maternal grandmother passed away before I was born. My Mom doesn't talk about her a lot. One thing she said though has become a favorite saying at our house. Yep, that's right! 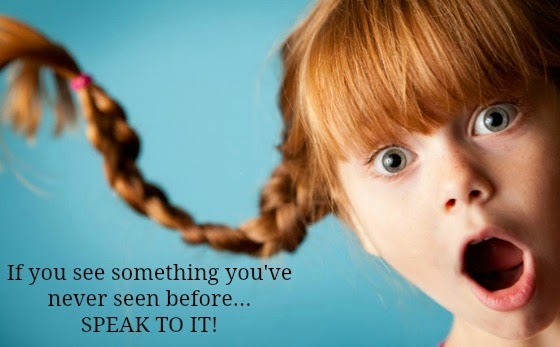 "If you see something you've never seen before, speak to it!" Every time I hear the phrase, I laugh aloud. It's a saying way before it's time especially when she coined it circa 1945. I wish I could have known my grandmother. She sounds like a colorful personality. I'm sure we would have been fabulous friends. I want to hear from you. Leave me a comment and tell me if you've ever heard this saying? I remember Ma very well I still think of her often. I loved staying up there and going to town with her Pa and Helen. Ma was a big talker and knew everybody. she was fun.